Thank you for your time discussing NYS prison history. . . I met today (1/22) with Auburn Historic Sites Commission members to request that they begin discussion on creating a venue in this city for learning about and dissemin- ating information about U.S. prison history and Auburn prison's role in NYS, U.S. and international corrections. I shared information from you and others . . . on this subject . . . and heard from the director of the Cayuga Museum of History in Auburn that an exhibit is scheduled for 2003 at the Museum entitled Auburn Prison -- Both Sides of the Wall. They agreed to engage in discussions about this topic. Thank you for taking the time to share your information. Mayor launches civic dialog on the museum potential of Auburn's role in correction history and contacts NYCHS to discuss historical information and perspectives. The Citizen publishes a story and NYCHS letter's about it. The mayor thanks and updates NYCHS. Auburn Correctional Facility: Prison or gold mine? AUBURN - Back in the 1800s, people were so fascinated with what life was like inside the old Auburn Prison they plunked down a quarter to go in and watch the prisoners. Mayor Carnicelli and The Citizen are to be congratulated for spotlighting Auburn correction history for community discussion. Along with Newgate in NYC and Sing Sing, the role of Auburn prison in the development of the penitentiary system was of major significance . . . The impact on American penology of Thomas Mott Osborne -- Auburn mayor and The Auburn Citizen founder -- continues to this day. . . .
Mayor Carnicelli called me in my capacity as general secretary and webmaster of the New York Correction History Society (NYCHS). . . . Such discussion is the kind of endeavor that the NYCHS was founded to encourage and support as a resource for information and communication. . . . I . . . stressed that I could not and was not speaking for NYCHS on any museum proposal . . . that no such museum proposal has been put forward by anyone to the NYCHS, and that I was receptive to the mayor's call as a resource providing historical information and perspective. . . .
With that context in mind, allow me to reaffirm my welcoming the correction history discussion and noting NYCHS' availability as a supportive information and communication resource for correction history discussion, in Auburn as elsewhere. Mayor Melina Carnicelli is banking that people will have that same kind of curiosity about the Auburn Correctional Facility. No, they wouldn't be able to go inside the cement walls where about 1,800 men live. Instead, Carnicelli would like to see the city open a prison museum in Auburn based on the facility's 186-year history. Without a formal proposal at this point, Carnicelli said she would like the city to examine the feasibility of a prison museum project. Carnicelli unveiled her plans as part of a list of ideas she would like to work on this year. "It's in the embryonic stage. It's an idea that I had in my head, and something that I would like the city to begin discussions on," Carnicelli said. . . .
Carol Kammen, the Tompkins County historian and a lecturer at Cornell University, gave Carnicelli the idea. In two recent visits to Auburn, Kammen has talked to the mayor about a prison museum. Last month, Kammen gave a lecture at Willard Chapel about the importance of developing local historic sites, in which she mentioned using the prison as bait for tourists to complement the Harriet Tubman house, Willard Chapel and the Seward House, she said. "You have one thing that no one wants to talk about and it's right in front of you. It's this white elephant that could be turned into an opportunity," Kammen said. She suggested the museum have a "campy" atmosphere featuring historic pieces that would "fascinate and show the awful," Kammen said. "It would show how we've progressed over time and how prisons changed. It would have marvelous, oddball things that would be a wonderful draw." City resident John Miskell, a retired deputy superintendent for programs at the facility from 1947 to 1980, likes the idea. "It's one of the oldest institutions in the city, and it contributed to the growth of the city in many, many ways," Miskell said. . . . .
As part of her research, Carnicelli also called Thomas McCarthy, general secretary of the New York Correction History Society, a group devoted to promoting the state's correction history. McCarthy, former public information officer for the [NYC] corrections department, welcomes the mayor's idea. McCarthy said . . . Other communities have developed the same kind of museums. The New York Corrections Academy in Albany has a collection of artifacts in a small room on display, including the electric chairs from Sing Sing and Clinton prisons. 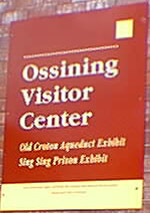 The village of Ossining in Westchester County has space in a visitors center with artifacts from Sing Sing, McCarthy said. Because Greenwich Village was the site of the first state prison, New York City is also interested in developing a museum, McCarthy said. "But you have a great story in Auburn," McCarthy said. "There's the strong connection with the Auburn System and to prison reform." The idea for a prison surfaced when local leaders lobbied for it after a prisoner of war camp was built along Owasco Lake for British soldiers during the War of 1812, he said. The lobbying worked, and it ended up the second prison in the state system, preceding even the more well-known Sing Sing Prison, McCarthy said. Mary and Mike Dwyer, former owners of Swaby's Kangaroo Court, had a museum of sorts at the North Street bar. Swaby's included a simulated death chamber. He still owns about 10,000 documents, photos and memorabilia from the prison. . . .
"When she's getting things together for the museum and wants something to complete the collection, have her give us a call," Dwyer said.